Mold is a natural enemy in the vineyards, something that can quickly destroy plants. However, the renowned Sauternes are among those “botrytized” wines, that oddly benefit from a mold called Botrytis cinerea. High humidity make the plant susceptible to the rot which, primarily late in the growing season, turns the grapes to raisins, enhancing the ripened flavors that sweeten the wine. Botrytis can sugar-coat the Sauternes, but cannot change that fact that these are old vines from the Bordeaux region, known for producing complex flavors. 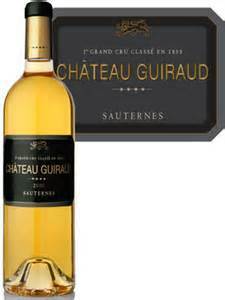 Sauternes have all the attributes of white wines from this region, but sweeter. Although the Sauternes I have tasted are unmatched by any other sweet wine, with price points beginning in the $50 range, they are beyond my and many wine budgets. The same stands true with the mighty Portuguese “ports”, the Italian Moscato d’Asti and the German late-harvest Riesling Spatlese, so special that they command an exceedingly high tariff. Though I would never dissuade someone from the opportunity to experience the world’s greatest dessert wines, common sense suggests that we look for other available choices that can still meet high standards at a more reasonable cost. The following are the current vintages of some of my favorite dessert wines from California and the Pacific Northwest. Sobon Estate has been a leading winery along the Shenandoah Trail in Amador County for several years, producing primarily zinfandel in the hills of Gold Rush country. Sobon could provide one-stop shopping for all your dessert wine needs with their orange muscat, zinfandel port and a distinct white port consisting of Rhone grapes, roussanne and viognier. 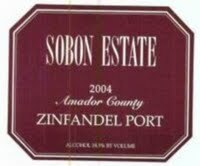 The 2012 Sobon Estate Zinfandel Port ($13), like earlier vintages, is a wonderful port-style wine that includes the rich, fruitiness of good zinfandel. This wine is perfect for discovering the complexities of modern dessert wines, moderately priced and high on quality. grapes are combined with orange muscat. In that the grand white grapes from Portugal are not available, the French roussanne, viognier and marsanne are able substitutes, providing a rich, luscious wine that requires no other dessert. The new 2012 ReZeerve Orange Muscat ($12) rounds out Sobon’s big three with the caution that they are all above 18% alcohol. As previously mentioned, late-harvest rieslings, mostly from Germany and the Alsace region of France, are among the most beautiful, aromatic and rich dessert wines anywhere. Rated 92 pts by Wine Spectator magazine and still somewhat available at a few suburban outlets, the 2011 Chateau St. Michelle Ethos Reserve Late-Harvest Riesling ($35), from the Columbia Valley in Washington State is simply elegant throughout and the best finish to any meal. A bit pricy, but bottles can be found and high ratings for dessert wines are not common. Vincent Arroyo Winery in north Napa Valley has produced their petite sirah port-style wine for over twenty years in the authentic method of using grapes from one vintage only. Petite sirah is accessible to many palates and some of the best comes from this region. Clearly identified by a striking silver embossed label, 2012 Vincent Arroyo Port ($25) is fortified with wine spirits and, as most dessert wines, has rich, age-worthy flavors and a high alcohol content. Visiting the winery years ago, I acquired two bottles of the 2009 vintage and one remains in my cellar. We can only imagine how good it will be. 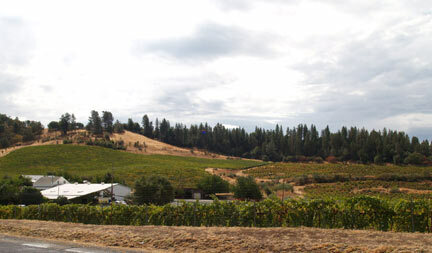 Bonny Doon Vineyards has released many creative and excellent dessert wines over the years. The latest 2013 Bonny Doon “Vinferno” ($24), made from 100% grenache blanc grapes, will certainly sustain their reputation. From the Arroyo Seco appellation in Monterey County, these grapes were planted with the “botrytis rot” in mind, but our drought has not yet allowed that to happen. It has extended the growing season enough that the “Vinferno” drinks like a late-harvest wine, perfect with after dinner cheeses. A few months ago I wrote of a dessert wine discovery from the Santa Ynez Valley in Santa Barbara County. 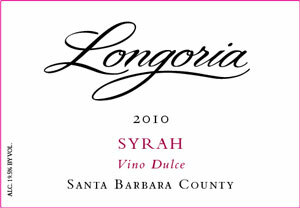 I first tasted the full-bodied 2010 Richard Longoria “Vino Dulce” Syrah Santa Barbara County ($23) paired with fine chocolate and all self-control immediately dissipated. I have since shared the experience with others at the conclusion of a syrah and cheese tasting. What I love about these new port-style, single-varietal wines is that, although they are fortified, one can smell and taste the complexities of the zinfandel, syrah and other grapes as well as the rich sweetness. In nose and on palate, the “Vino Dulce,” spices are protuberant and the cherries are baked; balanced yet expressive. 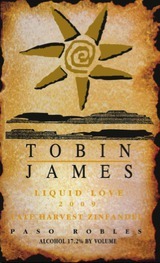 The best place to shop for any type of dessert wine under one roof is still Tobin James Cellars in Paso Robles. Aside from their classic 2010 Tobin James Late-Harvest Zinfandel ($14), dubbed “Liquid Love”, they produce a late-harvest Riesling, a muscat, a sparkling muscat, a port and the 2012 Tobin James “Charisma ($20), a zinfandel dessert blend that I have enjoyed for years. While most of the Tobin James dessert wines are moderately priced at $12, the 2011 Tobin James Port, “James Gang Reserve” ($25) is a bit more expensive but worth pursuing. The now defunct Martin & Weyrich Winery, formerly in Paso Robles, for years, produced an award-winning dessert wine called “Muscato Allegro.” Apparently there are still some older vintages of the Martin & Weyrich Muscato Allegro that have recently appeared on shelves of some suburban outlets. Look for a distinctively shaped bottle in the dessert wine section and, if you find some, it may be very competitively priced. received a 96 pt rating from Wine Spectator and was actually #23 on their Top 100 Wines of 2004 list describing flavors of “butterscotch and vanilla with hints of ripe apples.” It’s there for the taking, but, as you have discovered, there are many delectable options. This entry was posted on Wednesday, September 10th, 2014 at 4:57 am	and tagged with dessert wines, Guirard Sauternes, Sauternes, Sobon Estate, Tobin James and posted in 2001Guirard Sauternes, botrytis cinerea, Wine. You can follow any responses to this entry through the RSS 2.0 feed.